Heart and Voice. With the vision Christ Church Cathedral outlined in 2014, "Widening the Circle of God's Embrace with Heart and Voice" we have begun to hear this three-word phrase very often now. It is on our signs, on our Facebook page, in sermons. To some it might just seem a blank repetition of pretty words that fit nicely on a page. But 'Heart and Voice' is not a catchphrase. It's not a hashtag. It is the identity of Christ Church Cathedral. 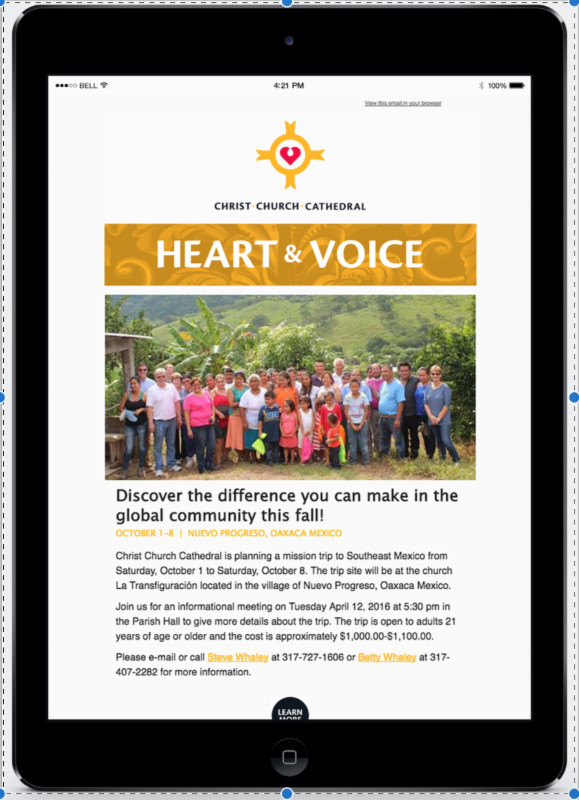 In the spirit of this mission we are moving our stories to a monthly newsletter: Heart and Voice. Every month we will use Heart and Voice to share stories of what's going on in our church community. Like the Crossroads publication of the past, we will highlight special moments in our church life, talk theologically, tell our stories as followers of the risen Lord, and share our successes and failures. A weekly e-mail, The Good Word, will arrive in your inbox every Thursday. This will contain announcements, calendar items, and the lay members serving on Sundays. You are a part of our Heart and Voice. If you have a story you would like to share I encourage you to send it. We hope that you will also be generous with us through this change as we move to the new format. Thank you, and I hope you enjoy reading!